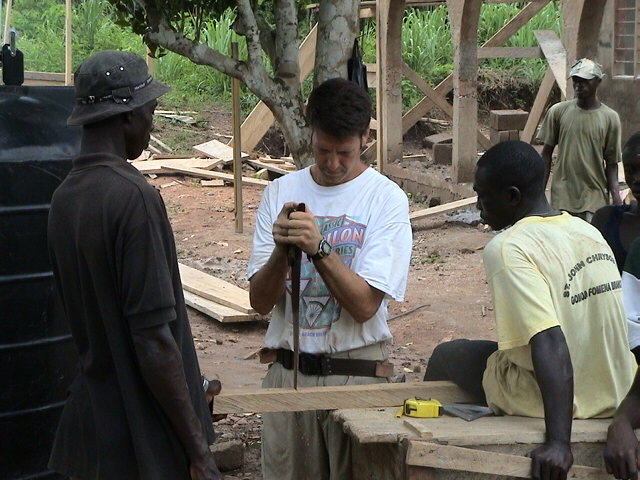 PSG partner Stephen Gidus spent three weeks of the summer of 2003 traveling to Ghana, Africa to help the Orthodox Christian Mission Center (OCMC) build a church for the Orthodox Christians living there.Stephen was part of a seven-member team of Americans from across the United States who were sent to build a new church in the village of Breman, in the eastern region of Ghana. The missionaries were welcomed by the Chiefs of Breman in a ceremony that included a procession from the camp to the village with dozens of village people following on foot. The OCMC Mission Team members were also privileged to be part of two historical mass baptisms. In the village of Brakwa, eighty-five people of all ages were baptized in a near-by river and became the only Orthodox community in that region of Ghana. In Breman, where the Team worked, over forty people entered into the Body of Christ through Holy Baptism. The Team members, including Stephen, were given the opportunity to be sponsors (Godparents) to these new Orthodox Christians. The Church in Ghana has limited income and survives only through the generosity of Christians making donations to OCMC. The church building project in Ghana was made possible through the donations of a single family. The Orthodox Christian Mission Center (OCMC), located in St. Augustine, Florida is a mission and evangelism agency that proclaims and practices the evangelical imperative based on the Gospel of our Lord and Savior, Jesus Christ, who commissioned us to go “and make disciples of all nations, baptizing them in the name of the Father, and of the Son, and of the Holy Spirit” (Matthew 28:19). OCMC recruits, trains and sends missionaries to preach, teach, baptize and to minister to the poor, hungry, sick, suffering and orphaned. OCMC supports the development of indigenous leaders and strengthens the infrastructures of churches, especially in, though not limited to, countries where Christianity is a minority, thus creating vibrant, eucharistic Orthodox Christian communities throughout the world.